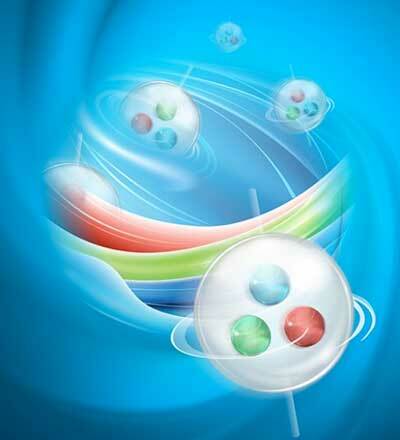 (Nanowerk News) The soup of matter’s fundamental building blocks swirls faster than any known fluid. This soup, a quark-gluon plasma that mimics the early universe, is also among the hottest and least viscous fluids ever measured. The plasma was made in heavy ion collisions at the Relativistic Heavy Ion Collider (RHIC), a U.S. Department of Energy Office of Science user facility at Brookhaven National Laboratory, for the study of nuclear physics. The results on “vorticity,” or swirling fluid motion, will help scientists sort among different theoretical descriptions of the quark-gluon plasma. With more data, this approach may also allow scientists to measure the strength of the plasma’s magnetic field – an essential variable for exploring how and why the plasma separates differently charged particles. Signs so far indicate the plasma’s magnetic field could be the strongest in the universe. Up until now, the big story in characterizing the quark-gluon plasma is that it’s a hot fluid that expands explosively and flows easily. But scientists want to understand this fluid at a much finer level. Does it thermalize, or reach equilibrium, quickly enough to form vortices in the fluid itself? And if so, how does the fluid respond to the extreme vorticity? The new analysis gives STAR physicists a way to get at those finer details. While there can be many small whirlpools within the plasma, all pointing in random directions, on average their spins should align with the angular momentum of the system, which is generated by the colliding particles zipping past one another at nearly the speed of light. The scientists track the angular momentum by looking for subtle deflections in the paths of colliding particles as they pass by one another, and see how the emergence of particles called lambda hyperons correlates with those measurements. The results (Nature, "Global Λ hyperon polarization in nuclear collisions") reveal that RHIC collisions create the most vortical fluid ever, spinning faster than a speeding tornado, and more powerful than the fastest spinning fluid on record. Increasing the numbers of lambda hyperons tracked in future collisions at RHIC will improve the STAR scientists’ ability to use these measurements to calculate the strength of the magnetic field generated in RHIC collisions. The strength of magnetism influences the movement of charged particles as they are created and emerge from RHIC collisions, so measuring its strength is important to fully characterize the plasma, including how it separates differently charged particles.